I know, I know, it does not seem to be the best way to start a post about my baby's Project Life with the third week. It just happens to be the latest one I finished. I will post the previous ones everyday I do not have anything to upload. For now, I must say I have still lots to learn about scrapbooking since I started a couple of months ago. I am missing expertise on techniques, supplies, imagination I guess?, etc. 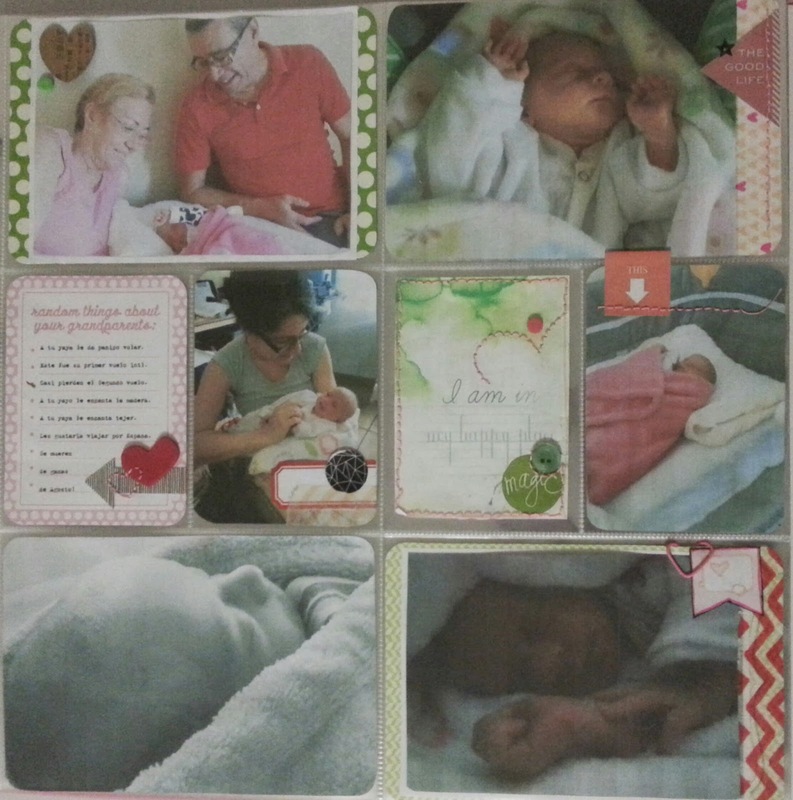 So far, my favourite websites of scrapbooking have made me feel quite fulfilled about my learning process. Two Peas in a Bucket's videos are pretty much how I love learning... for now. So, on this layout I used the easy design A pocket pages from Becky Higgins. I have put into practice some of the challenges the garden girls from Two Peas in a Bucket propose on their own layouts. On this layout I wanted to use the repeated colours of some of the pictures as a constant for the rest of the spread. My palette then would be green, red and pink. No words to explain how much Ania Maria Wolniak from Studio Calico inspires me as well. I decided to use here her 2 cards she gave away cause they matched perfectly my green theme on this spread.With all this, I tried to balance the amoutn and locatino of pictures with the coloured cards so, on each side you could find the 3 colours equally.The only kit I have used on this project life is the one from Becky Higgins Baby Edition for Her... and still enjoying it!Still, lots to learn to reach a little perfect detail from Stephanie Bryan but for now: Hope you like it! Unpunto Pty. Simple theme. Powered by Blogger.